Qantas will squeeze an extra row of seats into its Boeing 737-800 aircraft as part of a refurbishment of the domestic narrowbody workhorse. The addition of six extra economy seats increases the seat count of the Qantas 737 from 168 currently – 12 business and 156 economy – to 174 seats. By way of comparison, Virgin Australia’s 737-800s have eight business class and 168 economy class seats for a total 176. Adding extra seats will improve the operating economics of the 737, which Qantas flies domestically around Australia. Qantas currently has 67 737-800s, with a further four factory fresh examples to join the fleet by December. 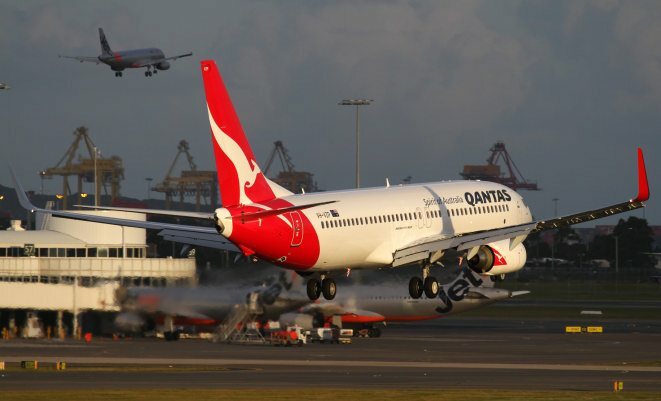 “This change represents a three per cent increase to the capacity of Qantas’s B737 fleet,” said Qantas Domestic chief executive officer Lyell Strambi. Indeed six extra seats per aircraft across a total fleet of 71 737s is the equivalent of adding an extra 2.4 737s to the fleet. Further, some 38 737s which currently do not have individual seat-back screens will have wireless technology installed to allow passengers to watch television programs and movies on their own devices. “Pending approval from Australia’s Civil Aviation Safety Authority, customers will be able to use their portable electronic devices in flight mode throughout the entire flight,” Strambi said. And all 67 aircraft will be “refreshed” with new seat covers and interiors to improve the in-flight experience of passengers, Qantas domestic chief executive Lyell Strambi said in a statement on Thursday. Space for the extra row of seats will come from a reorganisation of the rear galley, as well as a newer “slimline” lavatory, Qantas said. Customers were not expected to notice any difference when using the facilities. “Importantly, there will be no change to the amount of seating space each customer has,” Strambi said. Work on the 737s, which Qantas said was a “multi-million dollar investment”, was due to start in mid-2015 and take 12 months to complete. An extra 2.5 737s and no extra pilots, cabin crew or maintenance staff? Sounds like a pretty bloody easy decision to make. A good move. Of course, if VA make the same changes to their 738s, they’ll squeeze 182 people on board with lower over-heads and 2.1 “new 737s”. A Good Start For Qantas Short Hall, and Their 737-838s, Giving Passengers a Nicer Trip in a NG 737, Steps For Qantas Short Hall, When Will The Airliner ,Be Looking at Replacing, The 737-800s, By 2017 The MAX Boeing 737 Will Be Flying, a Newer 737 ,The MAX 737-8 ,Have a 15% Lower Cost, Per Aircraft, Vs a 737-800 . Always considered the 737 flying sardine cans ! How much worse will the passenger experience get? Qantas has said the seat dimensions wont change with this new refit. The dollar has spoken and because everyone thinks its ourtageous for any airline to make a profit (even though they are businesses like every other commercial business on the planet) airlines have had to find more and more inventive ways to make profits even though revenue continues to go down with people now very lucky to pay $199 one way to cross this big country. Airlines keep advancing with new technologies for us passengers and I for one definately appreciate their efforts and certainly wouldn’t want to go back to the days of old loud rattly piston prop aircraft that take a week and 6 stops to make it to Europe and without IFE!!! eeeeek! Is the multi-million dollar work due to start in mid-2015 going to be performed in Australia? Great, even less leg room. Stu Bee a big % of people sitting up front are upgrades. Very few pay these days. The question to ask is how often were they spilling pax? Only makes sense if they can fill the extra seats…. An excellent idea that appears to provide a significant amount of extra capacity (and therefore revenue) with little cost to the airline. If as the article suggests that there is no change to the interior configuration then it would appear a win-win for both airline and pax. The question I ask is how does an airline acquire 67 platforms before it comes up with the idea of this revised seating plan / configuration. While recognising that capacity is outstripping domestic demand at present (and in the recent past), by not implementing this plan from when the aircraft was introduced into service QANTAS could have potentially lost significant revenue. Additionally, if demand has been low the additional seating could have bolstered what was available for frequent flyer redemptions?